Read 2 times. Last read December 6, 2018. 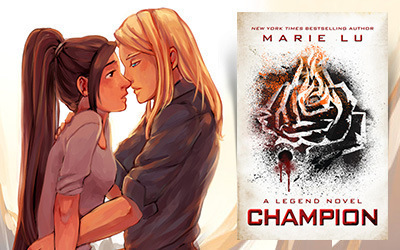 Sign into Goodreads to see if any of your friends have read Champion. 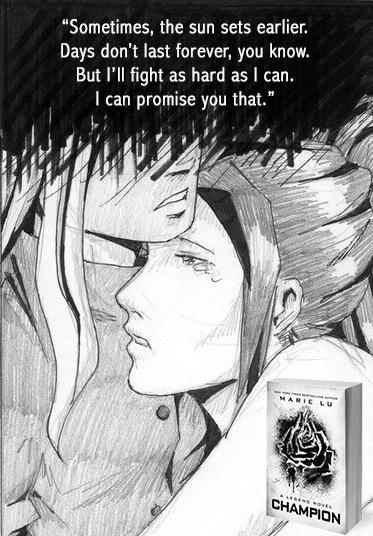 No, it's marked as to-read and those are Marie's words quoted. Ahhh, I've been lusting after this book since it came out, but I have yet to get it. I'm both really glad and really jealous that you liked the ending so much, haha. Love your thoughts on this book, it really was the perfect end to such a spectacular book. I finished it last night and cannot stop thinking about that ending, heartbreaking in the most beautiful way! For me every book in this series was better than the previous one; I fell in love with the characters & the world building and the action was such a sweet addiction, so getting to the last page was really heartbreaking. But what a beautiful ending that was. I am happy to see that I am not the only one feeling this way! Agreed on all counts there Ariana! The series just got so much better in every book, such an achievement considering most sophomore books tend to be filler and I often find conclusions leave me unsatisfied in one way or another but Lu just got it so, so right. I really hope the film adaption gets made so I can see all the crazy action on the big screen! Do you plan on reading her next series, The Young Elites? I cannot wait to get my hands on that! 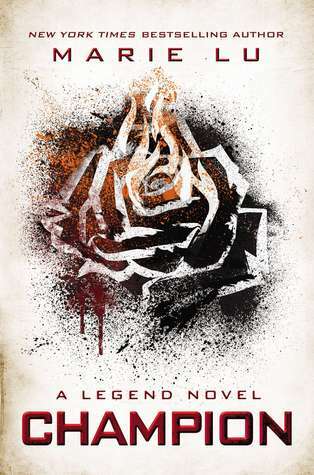 It's funny because the first time I heard about Legend, it was about it being made into a movie.. And after all this time there's still no news about that *sigh* I would love to see it on the big screen, even though on most cases I am disappointed by the adaptation. You know, I'd never even heard about The Glass Sonata, thanks so much for the heads up :) A quick search on google and I have to agree with you, it definitely sounds like a mix of Legend and The Young Elites. I even found an ebook of it for purchase on Lulu.com, I think that may just find its way onto my iPad! Having seen the things Lu has posted on Twitter and the images on her Pinterest, the ideas behind The Young Elites look fantastic. She keeps mentioning CBS films in the acknowledgements for every book so I'm optimistic (however delusional that makes me!) that if their relationship is still on going, one day it might find it's way to the movies. Though, like you, I'm often disappointed by the majority of film adaptions so I just pray that the right people take on the story. There's such awesome potential there! I read 2 excerpts from The Glass Sonata in "Legend - Collector's Edition", I didn't know there were plans to release it to the public though (?). Marie Lu was not completely satisfied with it, but Day was born from that story and I am grateful for that. I follow the 'The Young Elites' board from Pinterest too, I try to keep my expectations in check but I am really excited by all that potential (Also.. X-Men meets Assassin's Creed 2 meets Game of Thrones, all this with a dose of fantasy? It sounds crazy, but I'm totally sold). I'll keep my fingers crossed for the movie to come to life ( ~ for them to pick good actors that can play & for them to make justice to the story). At this point I am crazy excited for 3 movies (hopefully) soon-to-be-made: Legend, Daughter of Smoke & Bone AND Jellicoe Road. If I don't like them I think I'm gonna cry a bit, LOL. I actually bought it and on the first page there is an explanation! Apparently a fan had been reading the excerpts Marie Lu posted and wanted to see how the story ended, so he asked for permission to put together a copy for publication and Lu (being the graciously awesome author she is!) agreed :) I'm excited to see the formation of Day's character before he popped up in Legend! I try to keep my expectations in check, but after reading Champion and seeing all those pictures I'm definitely finding that an arduous task! Especially as X-men, Assassin's Creed 2 and Game of Thrones are all marvellous entities in their own right - surely a mix of this, as crazy as it does sound can only end up being something awesome! I wasn't aware they were making plans for a Daughter of Smoke & Bone film! It's a book that has been sat on my shelf just waiting to be read, I think knowing that now has jumped it to the head of the line. There is honestly nothing worse than a bad adaption. Did you ever see The Host or Beautiful Creatures movies? Wow, they were just terrible lol. I saw Catching Fire last night though and that completely blew my mind, definitely one story that has been masterfully adapted! Daughter of Smoke & Bone is a favourite of mine, I loved even more the second book and now can't wait to see who the story ends. In good hands it would make an awesome adaptation as the world building is quite fabulous (I also think it will be made by the producers of 'Alice in Wonderland' & 'Oz' -don't shoot me if I'm wrong- so I am a bit excited here). I've seen The Host, but I wasn't disappointed as I was bracing myself for low quality - I enjoyed some favourite moments and witnessed how the characters were stripped of emotions and personality, but oh well... Didn't expect too much. I didn't see Beautiful Creatures as even the trailer left me with a 'meh' feeling and I simply couldn't make myself watch it in full.. I searched for some news about Legend - nothing quite new, but I hope for the best. Fabulous review! It's not often that you end up loving all three books in a series. So glad this ended so perfectly!! You are very talented in your artwork! Cannot wait to read more by this author. Yes, that's true, not many series got to keep my attention through all books. But I loved this one even more each time. I completely love that first picture you have! This book and "UnDivided" are the best ending books to a series I have ever read! They are my two favorite series!